It's not a legit Kentucky Derby party unless there are legit snacks and straight up meals, and recipes don't come any legit-er than these. Why? They're courtesy of local Louisville establishments. 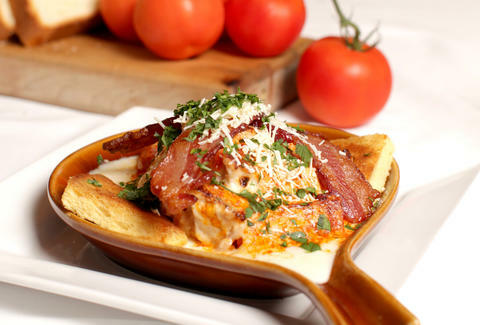 In fact, the Brown Hotel invented one of these dishes. So let your eyes -- and eventually your digestive track -- feast on these race day-worthy meals. In a sauté pan on high, cook carrots in vegetable oil until golden brown, about 4 minutes. Add onions and poblano peppers and continue cooking until browned, approximately 5 minutes. Add garlic, cumin, paprika, and salt and continue cooking until garlic is aromatic and spices are toasted, about 45 seconds. Add black-eyed peas, hot sauce, oregano, and black pepper and mix well. Transfer to sheet pan and allow to cool. In a large bowl, combine cooled mixture with parsley and panko. Add salt and pepper to taste. 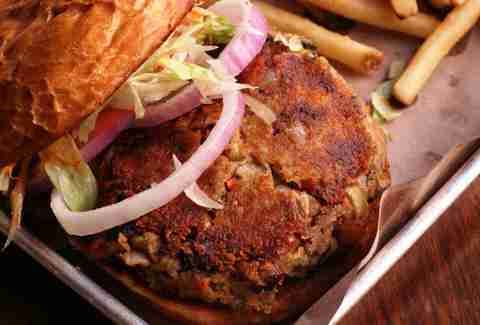 Portion in to 7-ounce patties and serve on brioche bun with chipotle mayo, lettuce, tomato, and onion. Whisk heavy cream into roux and cook over medium heat until cream begins to simmer, about 2-3 minutes. Remove sauce from heat and slowly whisk in Pecorino-Romano cheese until sauce is smooth. 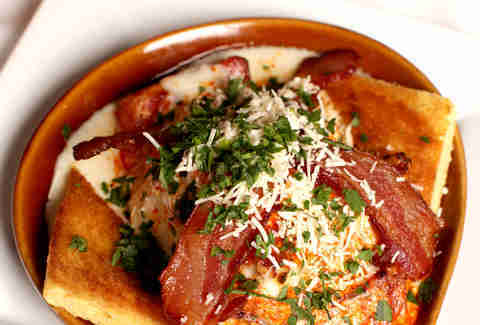 For each Hot Brown, place one slice of toast in an oven-safe dish and cover with 7 oz. turkey. Take the two halves of Roma tomato and two toast points and set them alongside the base of the turkey and toast. Pour half of the sauce over the dish, completely covering it. Sprinkle with additional cheese. Place entire dish under a broiler until cheese begins to brown and bubble. Remove and cross two pieces of crispy bacon on top. Sprinkle with parsley and paprika and serve immediately. To create the ganache, heat cream to steaming in a saucepan over medium high heat. Pour over dark chocolate in a large mixing bowl and cover with plastic wrap for at least 15 minutes. In a separate bowl, crumble white cake and mix in bourbon. Stir chocolate and cream mixture until well blended. Add the white cake mixture to the chocolate ganache and stir until blended. Cover and place in the refrigerator until the ganache mixture is set up, about two hours. Melt dark coating chocolate. 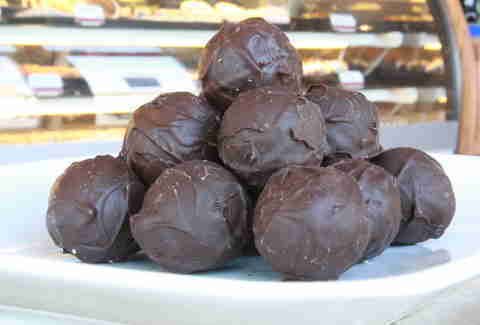 With a scoop, form the desired size ball from the ganache mixture. Dip the ganache ball in the coating chocolate to cover. Let the excess run off and set on parchment paper until it is set.